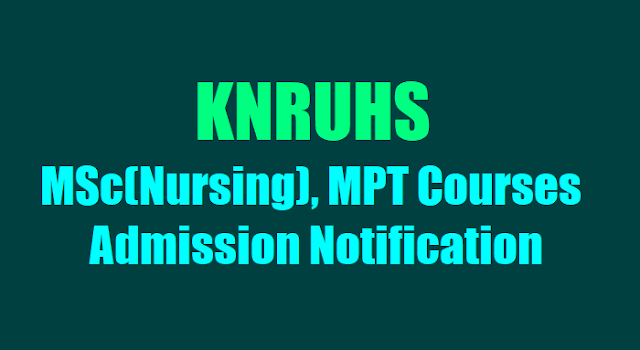 KNRUHS MSc(Nursing) and MPT Courses Admission Notification: KNRUHS MSc Nursing Course Entrance Test, Hall tickets, Results 2017/ KNRUHS MSc Nursing Course Entrance Test 2017, KNRUHS MSc(Nursing), MPT Courses Admission 2017 Notification. KNR University of health Sciences, Telangana State has iisued MSc(Nursing) and MPT Courses admission notification 2017. The University invites applications from the eligible interested candidates for admission into into MSc (Nursing) courses through Computer based online Entrance Test and M.P.T. courses without Entrance Test for the year 2017-18 for the seats in Colleges affiliated to KNR University of Health Sciences, Vijayawada. The candidate desires to appear for Entrance Test for admission into M.Sc. (Nursing) Courses or admission into MPT Courses without Entrance Test shall apply through online on the Website http://www.knruhs.in/public_org/ from 20-10-2017 to 23-10-2017 upto 5.00 PM only. The online application can be filled through any computer with internet connection (home/internet cafe/net center). For other details read the Prospectus carefully. The Prospectus of the courses, Instructions for filling online Application and Sample of filled-in Application is also available on the University Website http://www.knruhs.in/public_org/ . Both women and men candidates are eligible to apply for the M.Sc (Nursing) and the Service and Non-Service candidates should not have completed 45 years of age as on 31st December of the year of admission. For candidates belonging to SC and ST's the maximum age limit shall be 48 years. The candidate should have passed B.Sc., (Nursing) /B.Sc., Hans (Nursing)/Post Basic B.Sc., (Nursing) from an Institution which is recognized by the Indian Nursing Council with minimum of 55% aggregate marks and 5% relaxation of marks for SC and ST candidates. Should be a regular employee of the Government of AP as per regulation 2.1.2 (AP Medical & Health Services and AP Vaidya Vidhan Parishad) and shall have put in not less than 5 years of Service in the said Dept., in any capacity in Nursing. b) Minimum one year of work experience prior or after Registration of Post Basic B.Sc., (Nsg.,) courses on 31-08-2017. Candidates who have passed BPT degree of KNR University of Health Sciences or equivalent Degree, and have completed internship on or before 31-08-2017 are eligible to apply subject to the fulfillment of the condition stipulated in Regulation 3. Candidates possessing the degree from Universities other than KNR UHS must produce the equivalency certificate issued by KNR University of Health Sciences, Andhra Pradesh, Vijayawada. The candidate should clearly superscribe on the cover containing online application form as "Application for MSc (Nursing) ET-2017" or "Application for MPT - 2017"
4. Date and Time of Entrance Test: MSc (Nursing) Courses on ......... from 11.00 AM to 12.30 PM.